Starting a membership site is a smart business move, but only if you do it right. Every month dozens of people start membership sites only to shut them down just a few months later. Often the failed site ruins their reputation because they didn’t deliver what they promised to members. In other cases, they didn’t pick the right topic to begin with. Here are the top seven mistakes that you can make with a membership site and how to avoid them. If you pick the wrong topic, you’re doomed from the beginning. A membership site needs a wide customer base. Your topic should be specialized but not so narrow that you can’t attract new members on a consistent basis. Unlike a short report or niche site, your membership site topic has to be large enough that you can produce fresh content month after month. Pick a topic that a lot of people are interested in but that also has the potential for evergreen content. Members of your site are looking for fresh content every month. You need to give this to them or they’ll unsubscribe in droves. You should develop an editorial schedule so you know exactly what you’ll deliver each month. This will help you stay on track. Base your editorial schedule on the benefits that you promised in your sales letter and you’ll have happy, satisfied customers that will stick around for month after month. Your sales letter is your 24/7 sales person. It doesn’t matter how much traffic you drive to your membership site if your sales letter isn’t doing its job. If you don’t trust your own copywriting skills, hire a professional writer. The investment will be well worth it as you see higher conversions and more members in your site. You should always have new members coming into your membership site, but the only way you can do that is to market your site continually. You should be conducting pay per click campaigns, distributing article marketing articles and doing social networking to drive more traffic to your site. Work this into your weekly plans so that you can keep the flow of new members consistent. When you start a membership site, your members are looking for a lot of attention and care. They want to connect with you. Most of this will come in the form of an easy to use site with quality content. But you should also make it a point to be accessible through e-mail or a help desk function. There’s a high level of trust involved in a membership site, so make sure you’re there for your members. If you’re not looking for opportunity for backend sales, you’re leaving money on the table. Opportunities for backend sales exist in many different places in your membership site. You can sell advertising space within the site or create a platinum level of membership with special coaching. Just because the members are paying a monthly fee doesn’t mean they won’t be willing to pay for extra information on the site’s topic. If you’re concentrating on getting members but aren’t worried about keeping them, you have a recipe for disaster on your hands. Retention is critical. It takes much more effort to get a new member than it does to keep one that you’ve already got. By posting consistent content, offering polls, running contests and getting involved the community in your membership site, you’ll be able to hold onto the members you’ve got. These 7 mistakes could be dooming your membership site. Correct them and see your sales soar. If you’d like to eliminate these mistakes in one simple step, then consider grabbing a Membership To Go package. 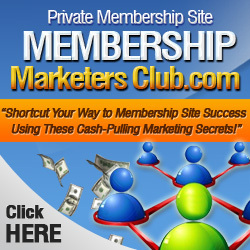 I think you’ll find that using the Membership To Go package for your own membership will eliminate these costly mistakes and keep you on the fast track to membership site profitability.